“You know that scene in every ‘genius’ movie where a guy says something like ‘You’re insane…but you may also be brilliant.’ Ben Gocker is that in reverse.” – Downtown at Dawn. 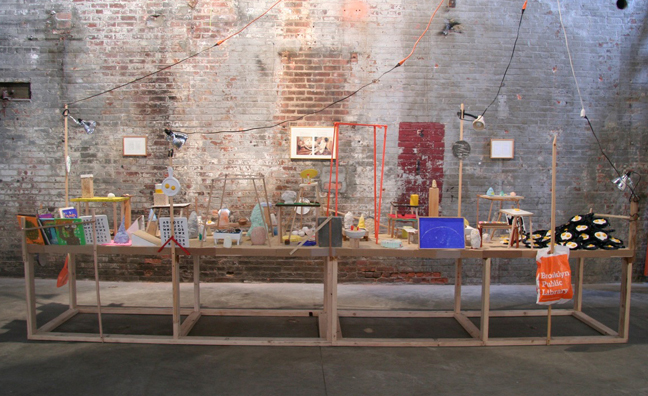 Since Gocker’s first solo exhibition with P.P.O.W in 2010, the artist has created a site specific installation for The Boiler in Brooklyn. There Gocker presents a 16 foot long installation of objects ranging from appropriated materials ( rotting carrots, turnips, parsnips, pennies, dice, toothpaste and hollowed out bread) to a vast array of plaster objects (molded fried eggs, chalk containers, plaster letter holders, alphabets and dog head pendants) along with hand sculpted cones, cylinders and eggs. Both the visual poetics of Gocker’s objects and the ephemeral nature of his mediums encourage a dialogue surrounding the passage of time and remnants of memories that inspire the artist to form objects that are both partial and abject. 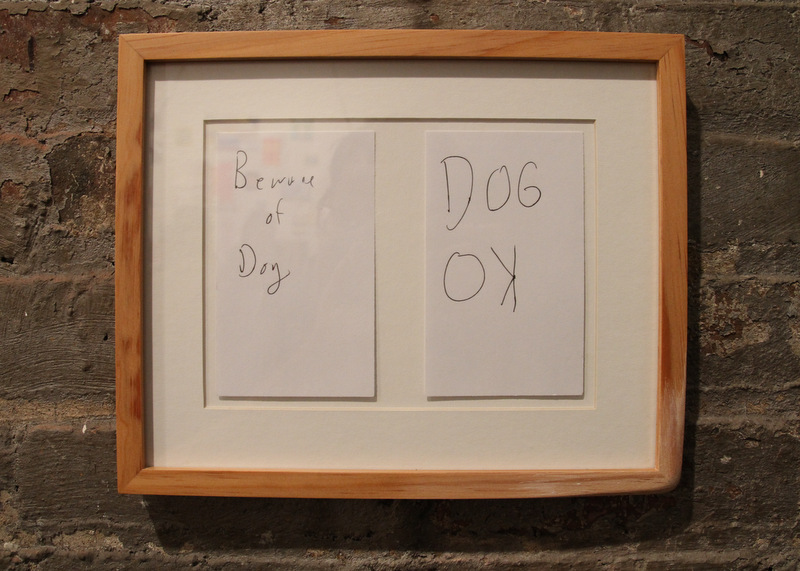 Previous works of Gocker’s such as Early Poem and Scroll construct conversations on underlying social and fictional narratives while Bad Dreams reads like an early memoir, reflecting his instinctual explorations of found materials. 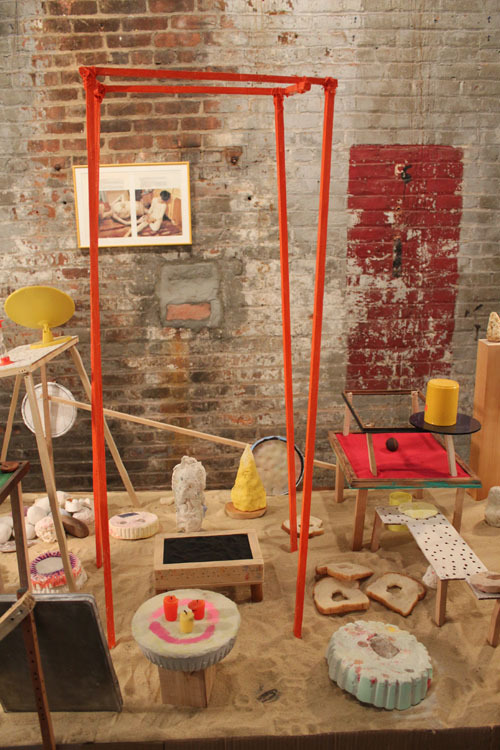 detail shot of Ben Gocker's installation "Bad Dreams"
At the floor of the table installation lies over looked piles of dirt and a heap of hollowed out bread that seemingly calls for an action by a maternal hand. The surface of the table is covered with a layer of sand, ever shifting to reveal charcoal marks, dispersed letters, seeds and money that lie beneath. 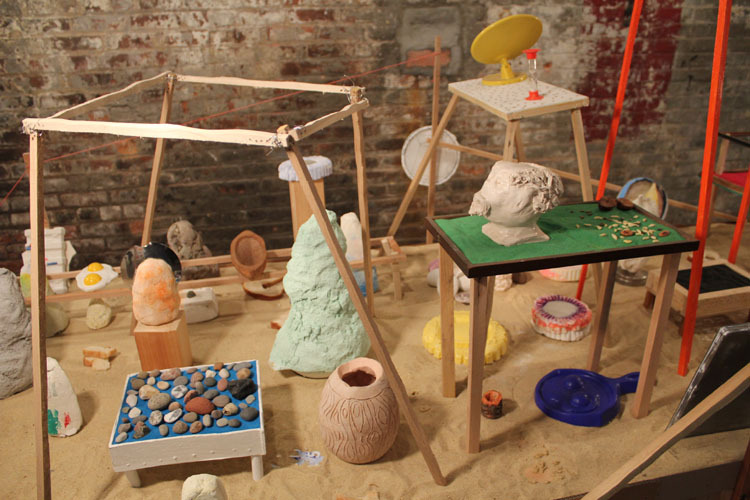 Thirteen platforms of varied heights are placed along the length of the table, five of which are sand boxes filled with red, green, black, blue and yellow sand that function as self contained collections and narratives. The most centrally located platform presents objects that are at the root of the artist’s reflection; a mirror and hour glass recalling Gocker’s urgency for self reflection and recollection of time. AFA: After looking through some images of your works from 2010 to present, a part of me felt like I was discovering someone’s intimate messages left carved in a tree, or even more serendipitous, like finding a message in a bottle. Has your work been a product of your intimate discoveries? AFA: Coming out of a MFA in Poetry in Iowa, a program home to Vonnegut how is it that you had the idea to start making objects? Was there a point in your literary expressions that made you feel like words were not enough? BG: You can do whatever you want. I had a lot of time. I wrote poems but also made things. I never had an idea to start making objects, I just did whatever I felt like doing. Words are more than enough, I mean they’re too much really. Objects are dumb, you know. But the words and the objects are pals and also enemigos. It seems to me you can’t get outside of the words or the things anymore than you can get outside of yourself. But if you can, I mean if you’re permitted entry to some sort of ecstasy, if there can be sorts of it, I guess there are, I guess it’s art it’s words as they start, the things and the words, to have some meaning sanded from them, to smooth off to let you slip by into another experience. But I can’t move beyond it all, to me I can’t put myself at a remove, but making art and writing are two ways I feel like I can begin to find that remove, even though it’s just like I’m more in the thing itself, you know? I like to draw a circle. AFA: The dialogue in your works feel predominately conceptual, while at the same time carrying an adolescent honesty. How do you feel towards your viewers? Does your work function openly? BG: I don’t have any feelings one way or another about the people who look at my work. I hope there’s something there for them, but if there’s not that’s OK too. There are a lot of things that aren’t there for people. There are a lot of things that aren’t there for people in my work too. Right now I’m thinking how it’s very helpful to me that you’ve asked me these questions. Sometimes I’m confused by the way people react to the work. In the way people react you can see the way they think, so mostly I’m just confused by how other people think. That happens on the train too. It happens to me and it happens to other people on the train too. I mean the subways here in New York. People getting on the train and then they’re on a train. What do they do? They look out windows, they look at phones, they listen to recorded music, they talk, they sit, they stand, they sleep, they eat egg and cheeses on a roll. I’ve lost my train of thought. I hope my work is open, but I bet at times it’s open and at times it’s shut.